Salman Khan Goes To 'Dabangg 3' Shoot On A Bicycle - Watch Video! It is a well-known fact that Salman Khan is quite a fitness enthusiast. He is often spotted cycling on the streets of Bandra which is where he lives. The first shooting schedule of ‘Dabangg 3‘ has commenced in Indore. Earlier Salman had shared a video with Arbaaz in which, they revealed that the two were heading to back to their place of birth, to begin shooting for the third installment of the Dabangg franchise. 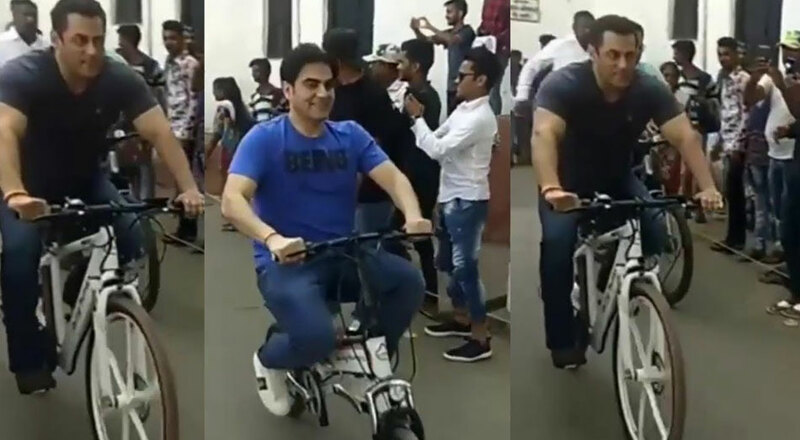 In a new video which has surfaced online, Salman and brother Arbaaz Khan are seen riding a bicycle heading to the shoot location. ‘Dabangg 3’ will be directed by famous choreographer and filmmaker Prabhu Deva. Sonakshi Sinha will also be seen reprising her Rajjo character in the film. South actor Sudeep is said to be playing the main antagonist in the film.